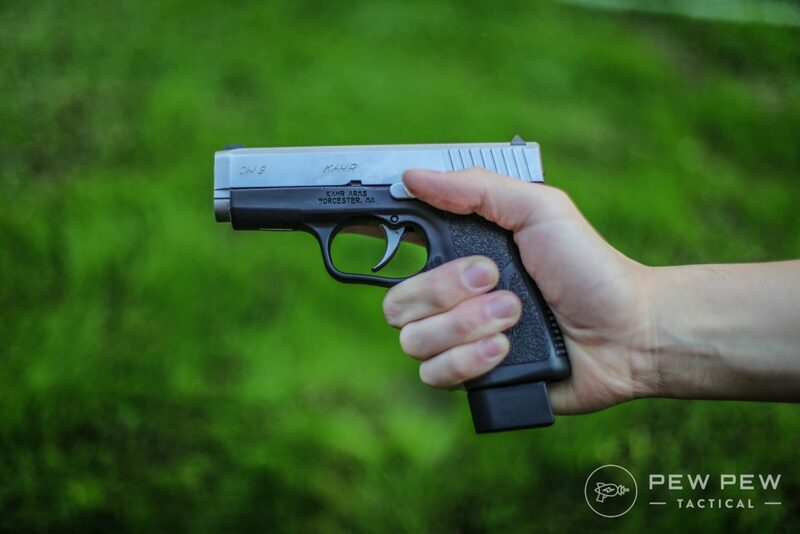 Want to know if the Kahr CW9 ($349) is right for you? 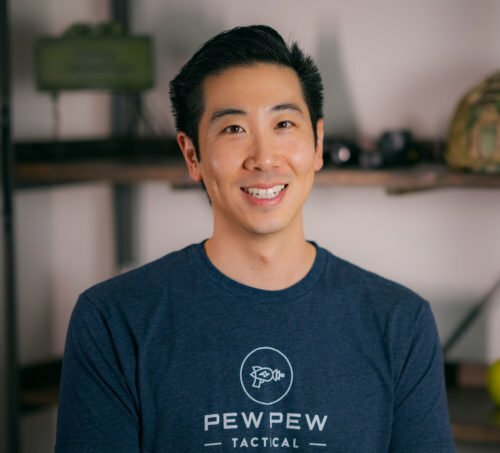 I’ll cover everything from fit/feel and reliability…to accuracy, upgrades, sizing, and holster options. 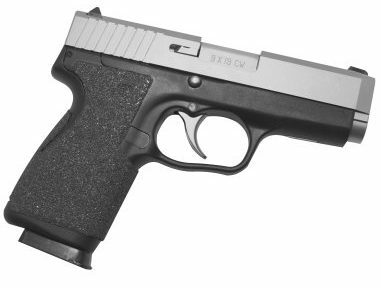 Kahr is known for making thin, single-stack, and highly-concealable handguns. And while the brand is not universally well-known or loved…I had to find out myself when I found a deal online for $270. CW9 vs CM9: The CW9 has a longer barrel, longer grip, and more capacity. CW9 vs P9: Almost the same, but the P series is the more “premium” model with better aesthetics, barrel, and more. Here’s a good infographic that shows the two differences between the CW9 and PM9 (smaller but more premium). Of all these…why did I gravitate towards the CW9? Easy…it fit the best in my hand. I actually managed to get a full grip. The CM series would have left my pinkie tangling. And what about the “premium” P9 ($670)? I just didn’t think it was worth almost $300 of a difference. Sure…it looks better but functionally they are the same too me. For the ranges you’re shooting, I don’t think the barrel will matter. 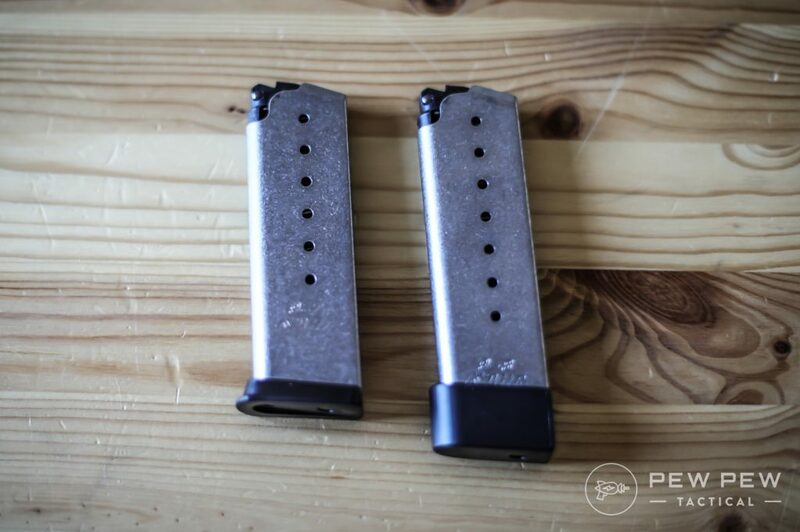 Pick up some extra mags and pocket the difference to buy training ammo! Definitely not for competition (unless you want a huge handicap). The perfect use of the skinny CW9 is for concealed carry. 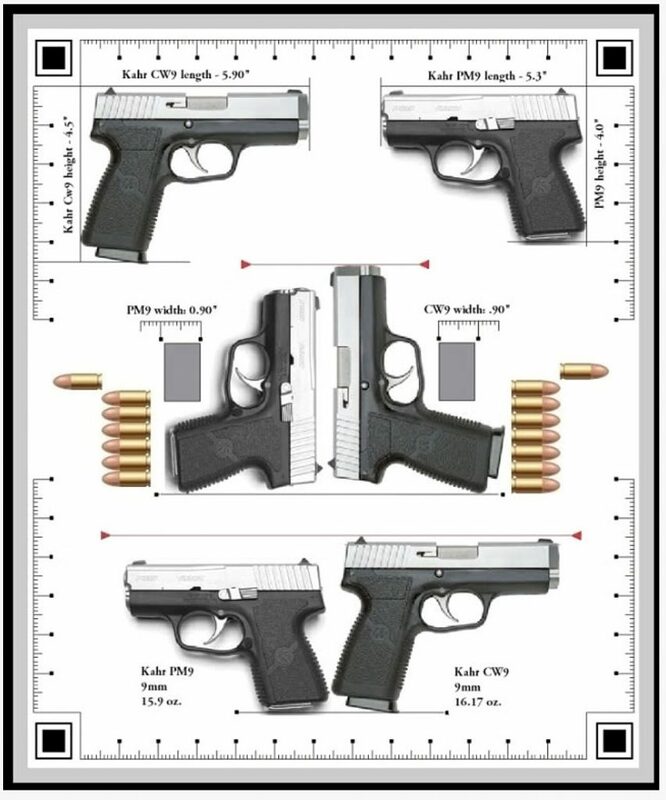 It’s much thinner and shorter than other guns (comparing against a G19, G17, and G34). Even against the G43…it beats it in thinness with .9″ to 1.02″…which doesn’t seem like much but against your torso I’ll take any reduction in width. AND for me…I can get a complete grip. So be sure you can do too otherwise it’s probably not worth it. It felt great in hand although I always like more aggressive grip. But since it’s a CCW I’ll leave it alone to avoid snagging issues. The slide starts off a little stiff…as does the magazine release. Make sure you can confidently rack it. And because it’s the more budget of Kahr’s offerings…there’s some sharp corners in the ejection port and the front of the slide…and some machining marks on the barrel. It’s something special to Kahrs. The best way I can explain it is a long smooth pull with a nice break…and then a long reset. Some instantly hate it…but I kinda liked it. Gives a little extra safety when you’re CCW-ing too. It took some getting used to but once I understood I had to almost fully release my trigger finger I was shooting pretty well even rapid firing. Since it’s not micro-sized…it had enough weight to offset the standard 9mm. Not light recoiling like full-metal guns…but not punishing like some pocket revolvers. I wouldn’t mind shooting 100+ rounds in a training session. No bench rest shooting for the CW9. If I’m using this it’s probably 7 yards or less. I used some of my favorite plinking ammo and some self-defense stuff as well. Check out Best 9mm Ammo for my full suggestions of both types. Before all this testing I had run about 4oo rounds of plinking ammo already through her in the desert. The sights are simple but work. 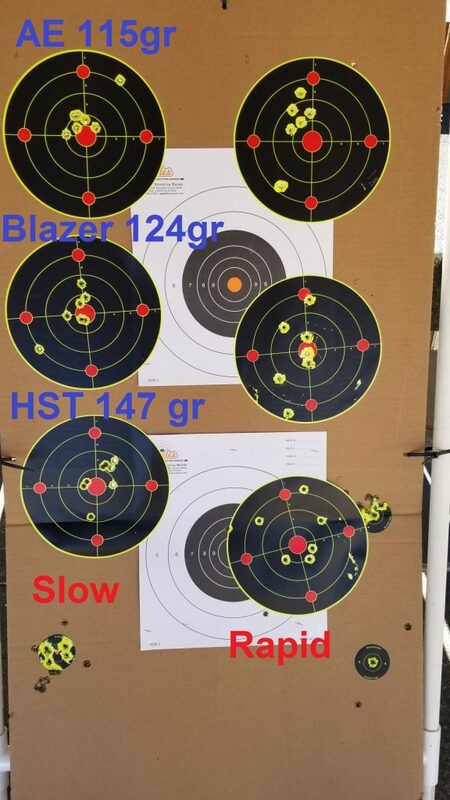 I shot standing up and with about a 3-5 second pause between each shot (first column). I stayed on target at 7 yards except for a flyer or two each string. And even at rapid fire (actually double-taps, 2nd column) almost everything was on paper…although a little spread out. But still perfectly minute of bad-guy. This is a big one for possible CCW guns. I believe the manual says to shoot 200 rounds through for proper break-in. I read about some people experiencing malfunctions during this time. But with AE 115 gr and Blazer 124 gr I didn’t any hiccups. And this is through both 7 and 8-round magazines. Hollow-points like the Federal HST and Winchester PDX-1 worked 100% too. Although I could feel the additional oomph with the 147 gr compared to the 115 gr. As a CCW gun…you’re probably not going to upgrade a lot. In fact…the only thing I would be remotely ok with doing is adding grip tape. Make sure you get the rubber one and not the granulate which snags too much. And of course…magazines. Kahr magazines aren’t the cheapest but so far they have been working well. 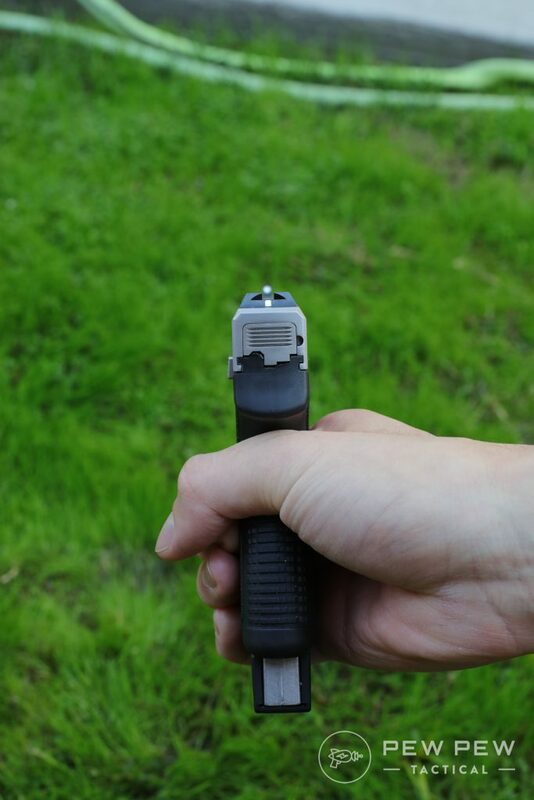 If you get 8-rounders…make sure there’s a nice audible click when inserting a full mag. I’ve heard some people having to file a little bit off the magazine where it meets the magazine well. 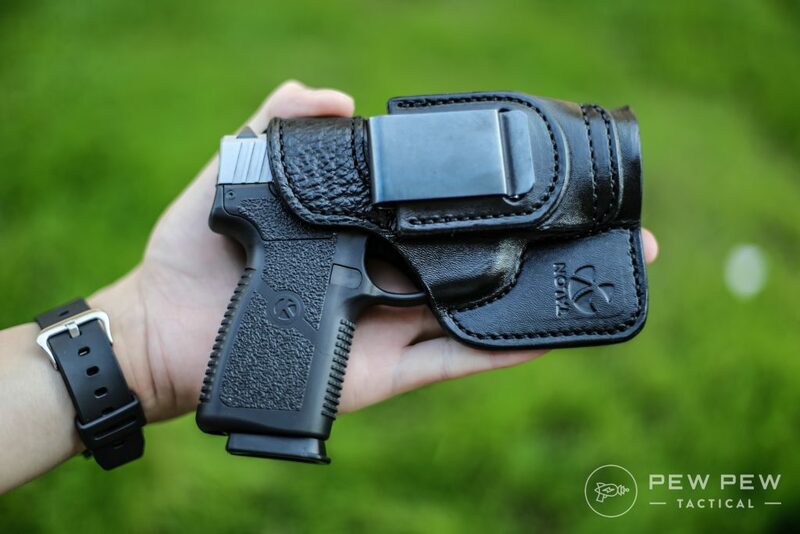 Finally…how about holsters? If you’re CCW-ing…you’ll want a good one. I got one from Talon Holsters specially made with shark skin. It’s comfy, stays put, and does its job well. But be sure to give it a few days to settle in with the shape of the gun. 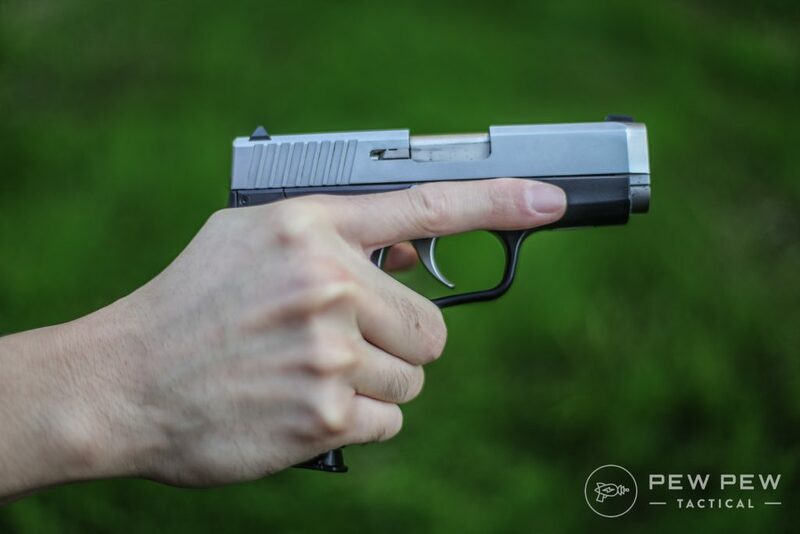 Finally…what about night sights? There’s the night sight version for a couple bucks more. Now how about some specs before we finish up? No failures of any kind in the ~500 rounds I’ve put through of factory ammo and hollow-points. Manufacturer suggests a 200 round break-in period but for me…it wasn’t necessary. 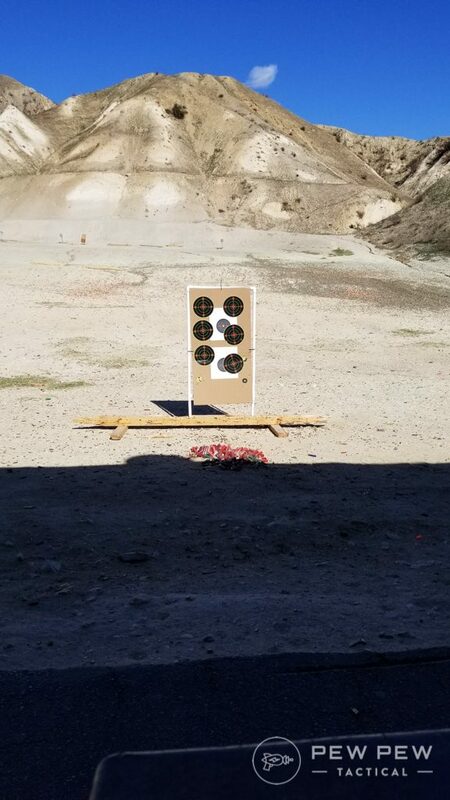 I didn’t test 50 yards+…but at reasonable distances it’s still way more accurate than I could be. Fits my hand well and I can manipulate the magazine release + slide release. Could use more grip but that’s personal preference. I couldn’t care less if it’s a simple roll mark vs engraving. But the P series does look a little cooler. And the sharp edges and machining on the barrel don’t help. It’s not really meant to be customized. You can add some grip tape, magazines, and a holster…but that’s about it. I got a screaming deal…but even at regular prices you’ll be hard pressed to find a small reliable gun like the CW9. If you’re looking for a concealable single-stack 9mm at a great price…you can’t go wrong with the CW9. Be sure to try out the trigger in store and also the grip. If you can’t fit all fingers on it I would recommend going with something bigger. But if you can…get it! 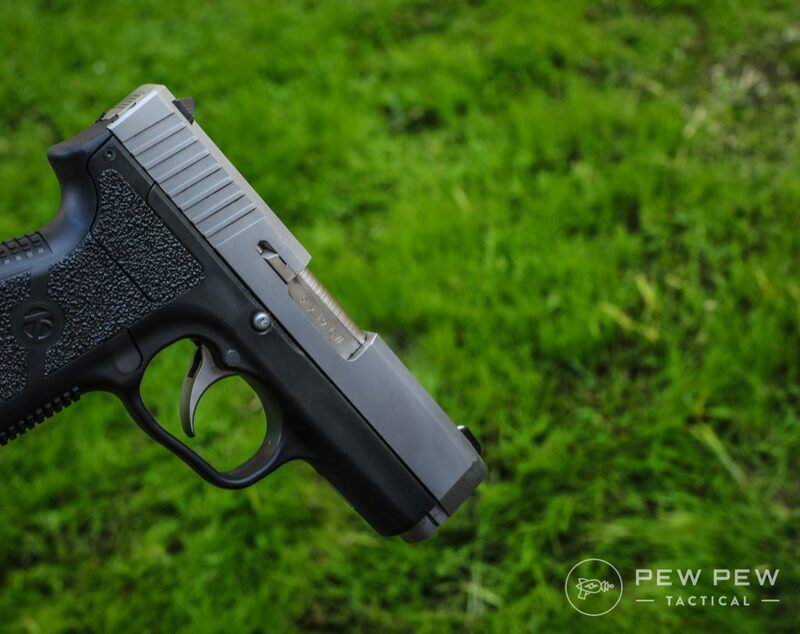 Or check out the rest of our recommendations in Best Single Stack Sub-Compact 9mm. Any of you already have the CW9…or ended up getting it (or something else)? How do you like it? Let us know in the comments. 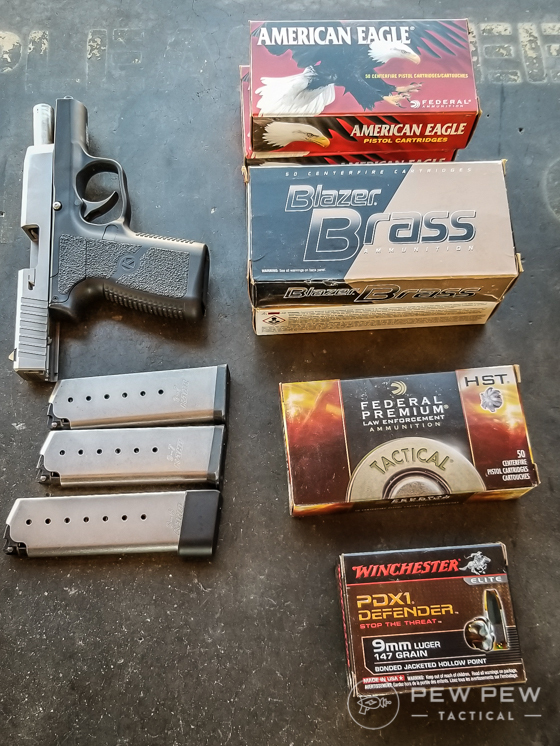 I lucked out and “won” an auction on gunbroker.com paying $255.00 for a brand new in the box CW 9, and that included shipping! This gun is soooo naturally pointable, I do not have to “go looking” for the sights- immediate sight acquisition!!! Shoots any ammo with crazy good reliability. Very well made. I give the CW 9 five stars without reservation. Very reliable, I upgraded the mag followers to all steel Lakeline. But still can’t get as good, tight groupings as my baby XD. I’ve had my CW9 for almost 3 yrs and have put about 1000 rds thru it. I’ve never had a FTF or FTE issue. This is my choice for concealed carry. SG is probably going to give you the best deal at about $265 as of 12/2018. You can’t beat the quality for the price. CT9–because Glock won’t build me a single stack 9×19 the size of 1911 Commander. And no, the G43 is to short and the G26 is too fat-azzed to be the Striker (fired) Commander. Actually the CW may be the best of the CM,W,T family. The M is a pinky dropper, and the T’s grip is long enough for 5.5 fingers. The W is goldilocks~just right.